Tigers are one of the world’s most loved animals but how much do you know about them? You can discover more about these magnificent big cats AND have the chance to win a fabulous special edition ‘Augustus’ the tiger adoption by taking part in the David Shepherd Wildlife Foundation’s Godalming Tiger Trail this summer. 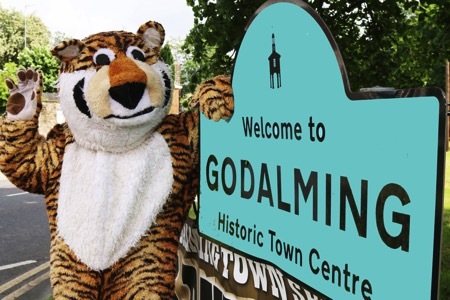 Launching with a street collection for wild tigers in Godalming on Saturday 23 July, the trail begins on Monday 25 July and embraces World Tiger Day on Friday July 29. To take part simply collect your free answer sheet and map from the Godalming Art Shop at the bottom of Godalming High Street and find the tigers and their questions in participating shop windows. Completed forms should be handed in at Waterstones and the winner will be notified by Tuesday 2 August. “It’s a wonderfully simple idea to raise awareness for wild tigers that we hope children and parents will love,” adds Jo. There are estimated to be c.3,500 tigers left in the wild. Since the turn of the 20th Century the tiger has lost c93% of its historic range and numbers have plummeted from 100,000. 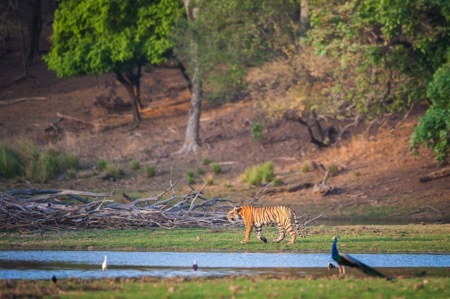 The main threats to the wild tiger are habitat loss, human encroachment and poaching for the illegal wildlife trade. 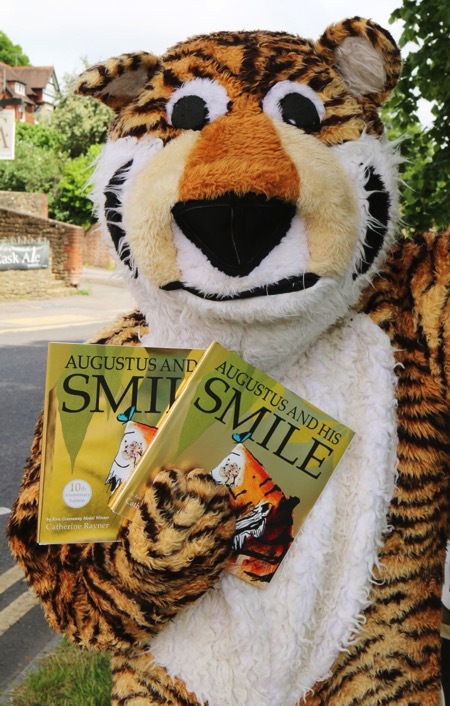 Catherine Rayner is an award-winning children’s author and illustrator and DSWF have teamed up with her to create the special edition Augustus adoption as part of the 10th anniversary celebrations of ‘Augustus and his Smile’. Proceeds from the sale of the anniversary edition also go to support DSWF’s tiger conservation projects.